With Apple’s yearly WWDC, World Wide Developer Conference, we got another iteration of Apple’s mobile OS – iOS 9. This new update brings Siri improvements, multitasking to iPad, and more. Notes app – make lists, format text, doodle on a blank canvas, and insert images. Siri New UI – a new user interface is displayed when activating voice dictation and Siri. New Siri functionality – set reminders from text messages and more. New Spotlight Search – swipe right on home screen to activate new Spotlight with suggestions on people to contact, apps to launch, nearby places, and news. Apple Pay on lock screen – double pressing home button while on lock screen to bring Apple Pay interface, depending on your security settings. New App Switcher – iOS 9 app switcher gets a new look from older iOS versions. Six-digit passcodes – instead of using 4-digit passcode, you will now be using 6-digit passcodes for more security. Settings Search – Capability of quickly searching in Settings app using search bar. Low-Power Mode – extend your device’s battery life by enabling this feature in new Battery settings. Go Back – when tapping on a notification that takes you into a new app, you’ll now have a button top left of the status bar to get back to the previous app. QuickType Keyboard update – shortcut bar, easy text selection, and keyboard shortcuts. iPad features – Picture in Picture, Slide View, Slide Over, QuickType features double press in notes. Side switch setting – all devices including iPhones now have the ability to change whether you’d like to use the side switch as a mute switch or orientation lock switch. iOS 9 has been downsized – iOS 9 only needs 1.3GB to install on your device. In comparison, iOS 8 required 4.53GB to install. For iOS 9 device compatibility, check: iOS 9 Beta Compatibility For iPhone, iPad, iPod touch. Currently, iOS 9 is only available to download if your device is enrolled in Apple Developer Program. 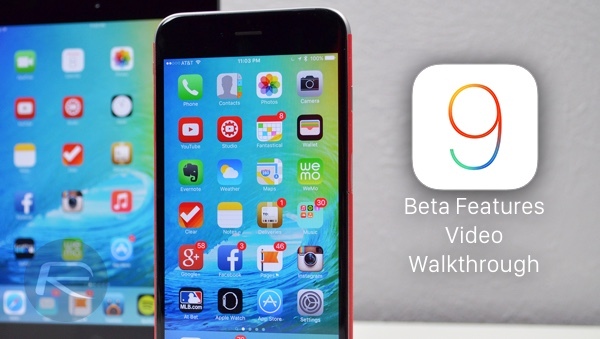 For those who are anxious to get iOS 9, Apple will be launching a public beta in July. You can expect the final build of iOS 9 later this year in the Fall.